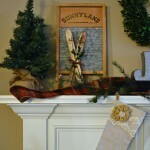 This year’s Plaid Tidings Christmas Mantel is quite a contrast to last year’s ‘winter white’ mantel. After our recent travels to Scotland, I fell in love with plaid all over again! If you have landed here after visiting my friend Beth at Unskinny Boppy, welcome! 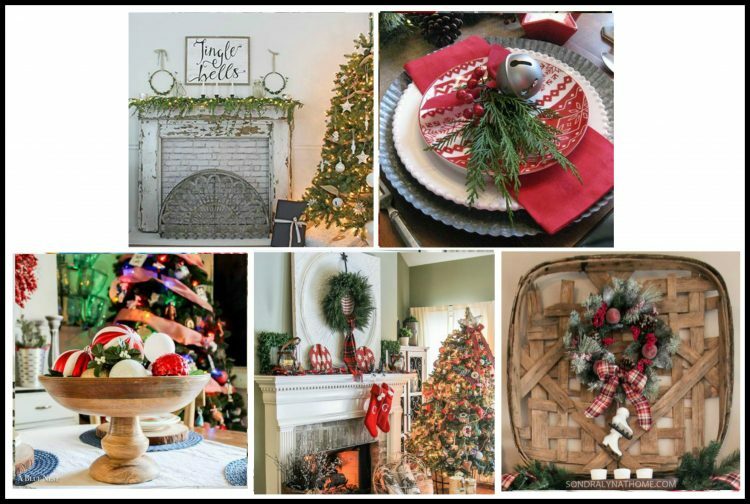 I am participating in a 3-day Christmas home tour with some of my best blogging buddies. Anyway, we all agreed it IS better late than never, so we teamed up to bring you some last-minute inspiration. The plaids, or tartans, that you see in Scotland are as varied as blooms in a flower garden. There are green ones, blue ones, gold ones… well you get the idea! One of the most well-know tartans is the red Stewart tartan, which is a lovely plaid of Christmas colors. The Stewart tartan is what most people envision when they think of the word ‘tartan’. It is predominantly red, with cross patterns of green and/or blue and usually yellow. I didn’t realize before our trip how much each clan is identified by their own specific tartan. For this year’s plaid, though I was looking for something a bit different and happened upon this lovely plaid that has red, black and tan… similar to the Burberry plaid. I loved the looser weave of it, almost a sweater feel. 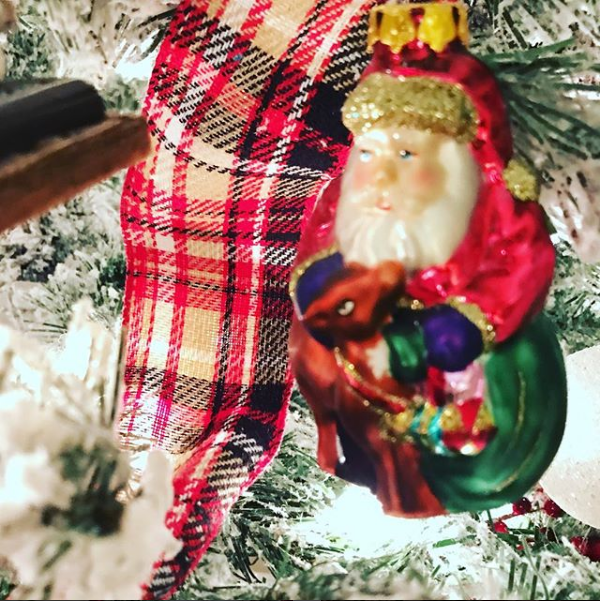 I used this plaid ribbon on both the mantel and the Christmas tree. I even wrapped a band of ribbon around 2 of the 3 stockings! 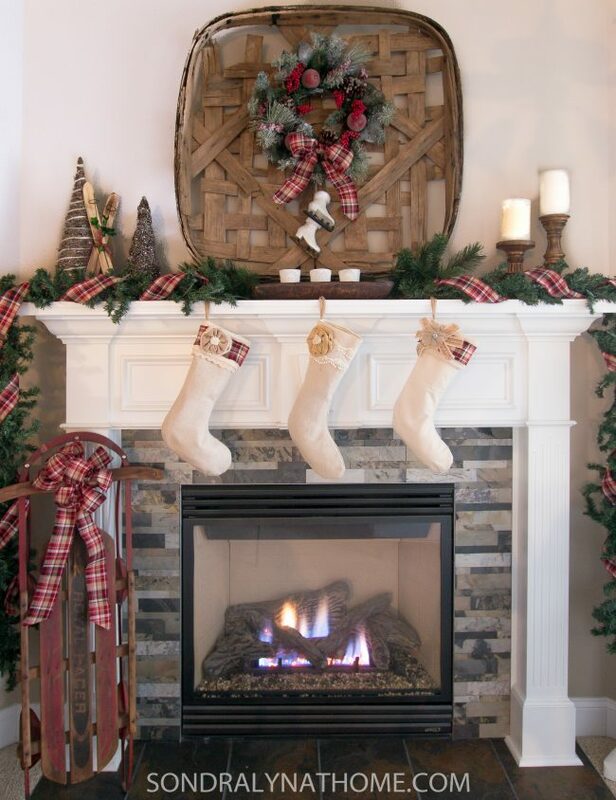 This mantel also features a vintage tobacco basket. I had one years ago, and not sure what happened to it, but I recently got one at a local antique store, University Pickers. Just for fun there’s a wreath (that I flocked myself, btw!) hanging in the center with a pair of skate ornaments hanging from it. 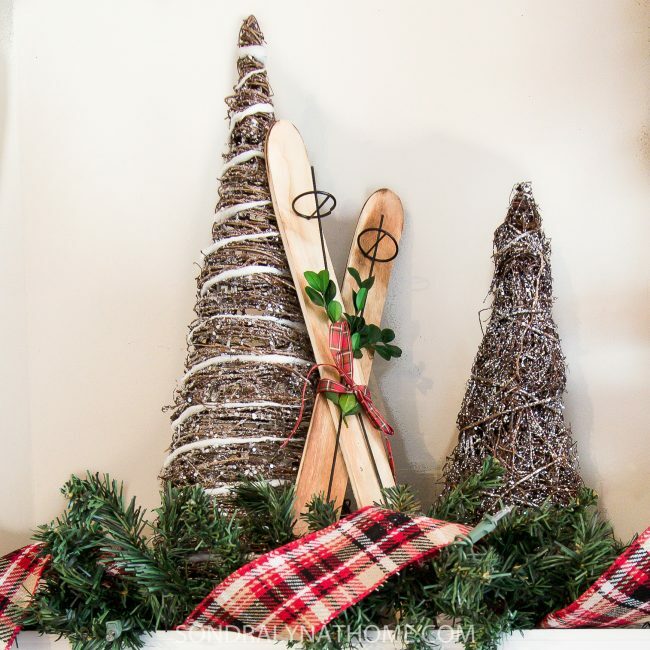 Continuing the ‘winter sports’ theme, you’ll find some mini snow-skis propped up by the trees and our antique sled tied with a big plaid tidings bow! 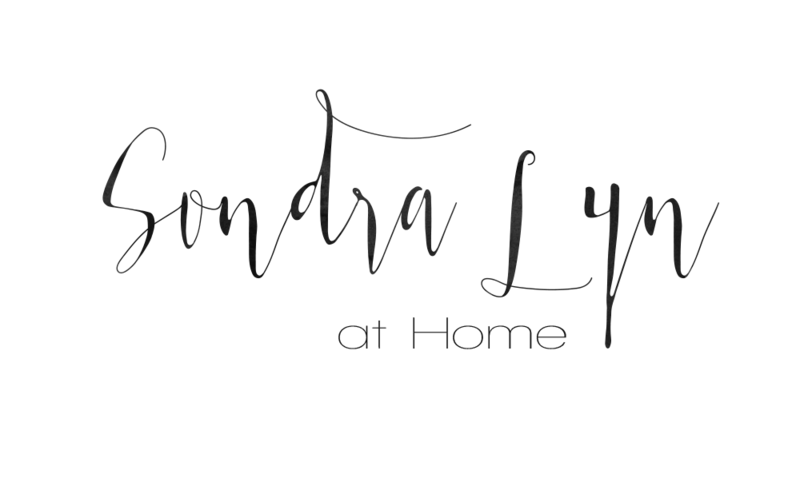 Be sure you head over to Barb’s site at The Everyday Home so you don’t miss a thing from our tour!! So, how is your decorating coming along? Are you finished, or are you a bit like us – late but not for lack of enthusiasm!?! What a cute theme. Your home is so lovely. 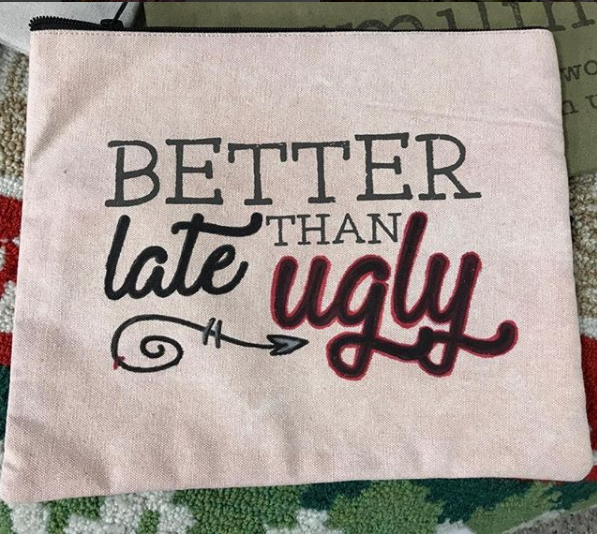 It could never be ugly. 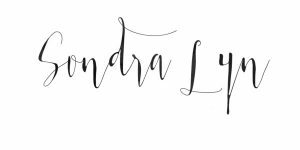 Sondra this is SO beautiful! I felt the pull toward plaid this year also, and went with it in a big way. My obsession with Outlander may or may not have had something to do with that (still jealous of your Scotland tour!!) It feels like plaid is the pattern of the moment, and it’s so classic and beautiful. 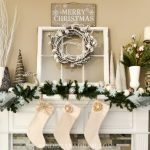 Your mantel is so pretty. One day I’m gonna make it up to University Pickers. I hear so much great stuff about it. Thanks, Beth! I’m obsessed with Outlander too!! I think that’s one reason I wanted to go to Scotland so much in the first place. 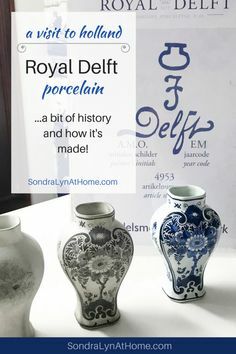 It did not disappoint! And the gals at University Pickers are the ones who put on the Booth Conference where I presented a session back in November (I saw your FB live about your experience that same weekend… so glad you could make lemonade out of it!). 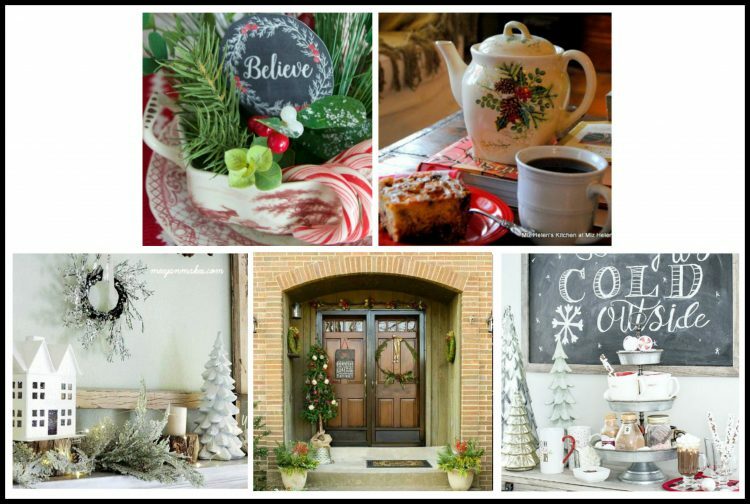 So many charming Christmas touches in your beautiful home. 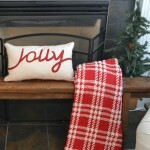 I love the plaid…and I’m a sucker for anything red! 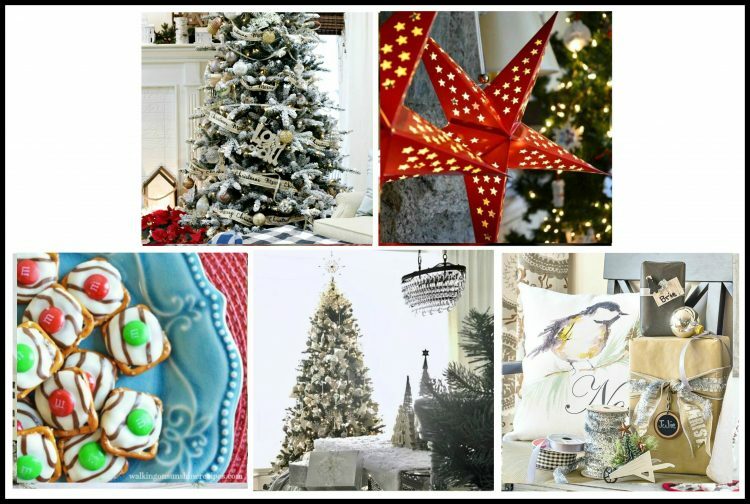 Merry Christmas, enjoy your lovely decor and Happy Hopping! 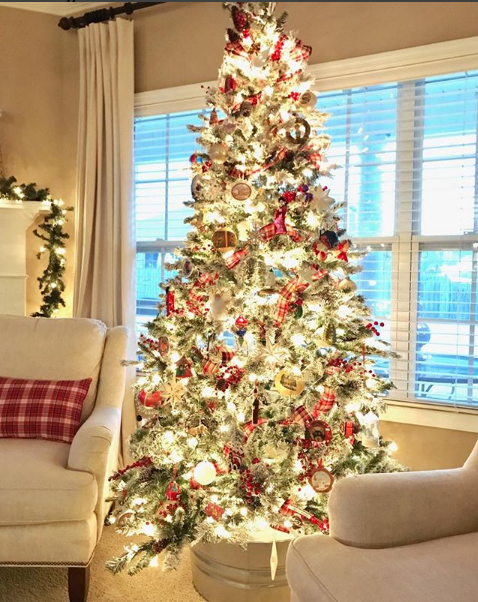 Your Plaid Tidings bring a very warm welcome to your to your beautiful home. 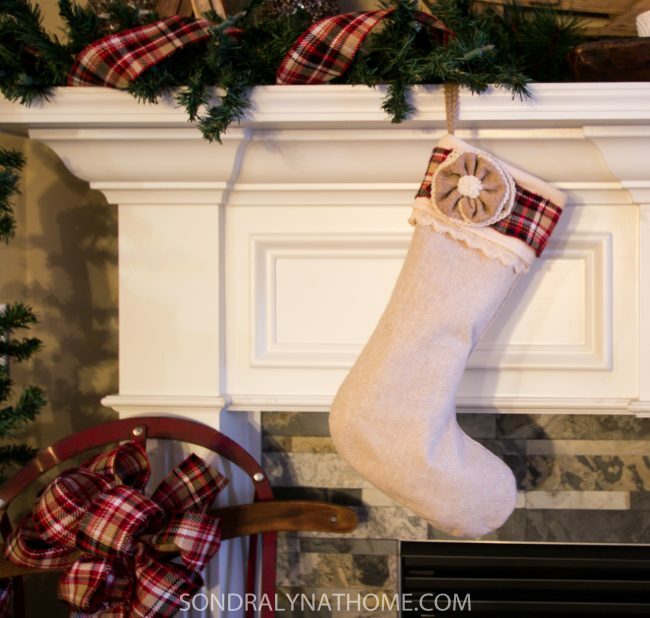 I love the trim on the stockings and the antique sled, great touches! Thanks so much for sharing and it is a joy to share the tour with you. You’re speaking my language! Blame it on my Scottish heritage, but I love plaid, too!! So happy to do this hop with you!! 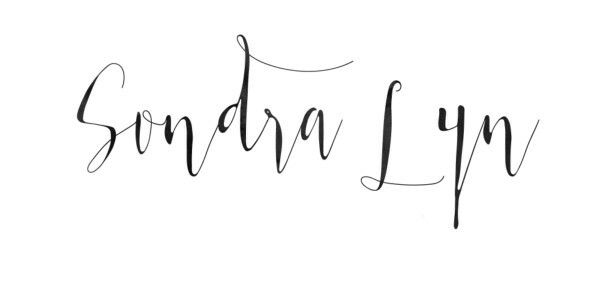 Sondra. 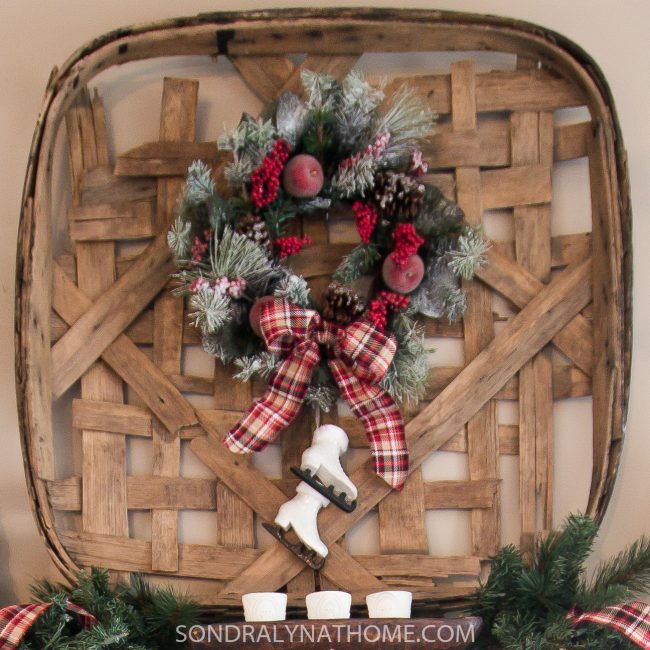 Your home is beautiful with the touches of plaid. 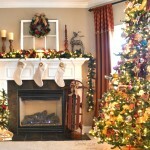 I love how you added them everywhere-from the stockings to your Christmas tree. SO pretty. You always have the best ideas and an eye for design. Thanks for inspiring me, as you always do. I know its not Christmas but I love plaid all winter long, but I use blue based plaids. Your house is beautiful. It looks like you use the same metal bucket as I do for one of my trees. I get complimented on it all the time. Again, you have a beautiful home. Niki… Thank you SO much!! Yes, my tree is just in a galvanized bucket that you could get at a farmer’s co-op!! And I love plaid any time of the year!! Thanks for joining me!